If someone you care for has been arrested in the Santa Monica area by the Santa Monica Police Department, and you’re in need information about Santa Monica Jail bail bonds, you’ve come to the right place. When someone has been taken into custody in Santa Monica, they will likely be transported to the city’s local Santa Monica jail. This is a small facility that only houses limited inmates. 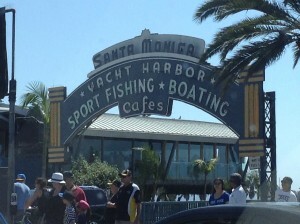 Santa Monica is one of the most visited spots in Southern California. There are trendy restaurants, the popular Third Street promenade, beautiful beaches and the historical Santa Monica Pier. Of course, even in the best of places, unfortunate things can happen. For fast answers and additional bail, arrest or charge information, we’re available 24/7 to answer your most pressing questions. If you have questions about a bail bond situation in Santa Monica, do not hesitate to give a friendly SCV Bail Bondsman a call at 310-782-2245, or, toll-free 877-422-4591. We are open 24/7. The Santa Monica Police Department is dedicated to the reduction of crime in the city and improving the communities’ quality of life. The Department has established a community policing model, with the value of keeping Santa Monica’s citizens involved in the crime prevention process. If the Santa Monica jail is overcrowded male defendants may be transferred to Twin Towers in Downtown Los Angeles or Lynwood Jail for women. Unfortunately, the process of bailing someone out of these larger county jails can take much longer (generally from 12-24 hours). We recommend bailing them out of the smaller city jails for a much faster and efficient release process. In California, the cost of a bail bond is set at 10% of the total bail amount. So, if the total amount of bail is $15,000, then the cost of a bail bond will be $1,500. This is a non-refundable premium as the bail agent’s fees are immediately earned upon the release of the defendant from jail. Please see our bail FAQ’s page for detailed information. When you call, we’ll ask a few quick questions to get the bail process started. If you’re not sure if they’re at the Santa Monica Jail, we can still find out their location and charges for you. In most cases, our bail agents can get to the Santa Monica jail quickly. We can process your bail by email or fax in just a few minutes, or we can have one of our licensed, professional bail bond agents meet you directly at the jail, or the location of your choosing at no extra charge. Once you’ve completed the, easy bail application, our bail bondsman will post the bond at the Santa Monica Jail (or any other facility where the defendant is located). We understand you may be under stress about your family member, friend or loved one’s arrest. At SCV Bail Bonds, we’ve helped many families just like yours get the people they care about most, out of jail fast. We are proud of our agents, who have high ethical standards and who stay up-to-date with latest technology available to the bail bond industry. Affordable bail bonds are only one part of our top notch service. We offer flexible payment plans to suit any budget, we accept cash, personal checks and all major credit cards, and best of all, our consultations are always free. You can call SCV Bail Bonds, 24/7 for information on someone arrested and taken to the Santa Monica Jail, locally at 310-782-BAIL (2245) or, toll-free at 877-422-4591. Let us assist you.